TRAP DESCRIPTION: Trap which measures 11" wide by 12" tall by 36" long. It works like our regular live traps using a spring loaded mechanism which is strong, durable and consistent. However, this design has two unique designs to it. 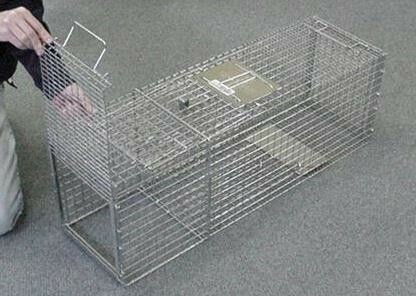 It has a sliding FRONT door which allows the trap to be used two ways depending on the type of trap set you need. The front door should be removed when using as a standard trap set. The entrance door is inside the extended frame of the trap so you are able to place the entrance up tight to any pathway through which target animals may enter. If they are coming through crawl spaces, the sides of decks, fences or any flat vertical surface you can set this trap against the surface and effectively force the animal to enter. Such sets can make for quick and easy trapping and though the need for bait or lure is not as important, we still recommend it is used. The second feature of this trap is that the front section has an opening which can be used to trap animals which have entrance/exit holes in the ground. By keeping the sliding front door in place you can now set the trap over these holes and essentially force the animal into the cage because it will have no other place to go. It also has a sliding rear door for easy baiting and animal releases. 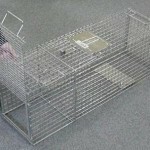 SIMILAR MODELS: LIVE TRAP 11" X 12" X 36" REAR DOOR and the LIVE TRAP 11" X 12" X 36"